Alice Lodge Backpacker free WiFi, free breakfast and free luggage storage. Great deals on 3 day Uluru camping tours. Airport Pick up available through Alice Wanderer for customers flying in and out of Alice Springs. You buy your ticket at the shuttle bus desk at Alice Springs airport for $17.00. Our small and secure property is Alice Springs most relaxed and unique with home style Comfort in the Red Centre. 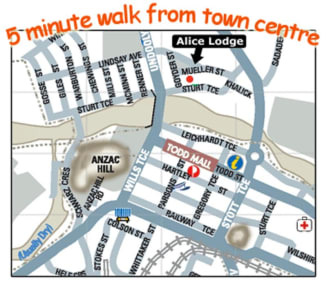 We are just a 10 minute walk from Alice Springs Town centre. We have free breakfast, free high speed Internet (including free WiFi), free linen, and free luggage storage while you're out on tour. 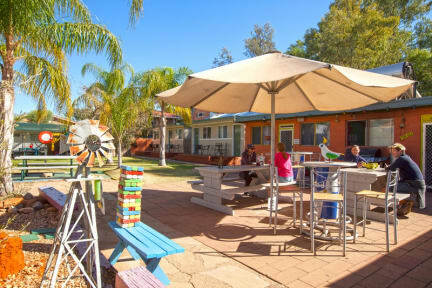 Facilities: A Sparkling Swimming pool and Suntan area, TV & DVD lounge, Fully equipped Kitchen/Outback BBQ, laundry facilities and relaxing hammocks. Please email only all cancellations directly to Alice Lodge Backpackers at least 48 hours before 12PM (noon) on your arrival date in advance, otherwise the first night will be charged onto your credit card. -Important (Airport) - look out for the Shuttle Bus desk next to baggage collection area . Airport-pick-up commences at 9.30am at the airport.,last shuttle leaves the airport at 5.10pm. Airport transfers $17.00 one way.